This painting was several paintings before it became what it ended as. I painted a complax and layered mandala and then proceeded to paint on the sacred water lilies, Nuciferus Pelumbo. 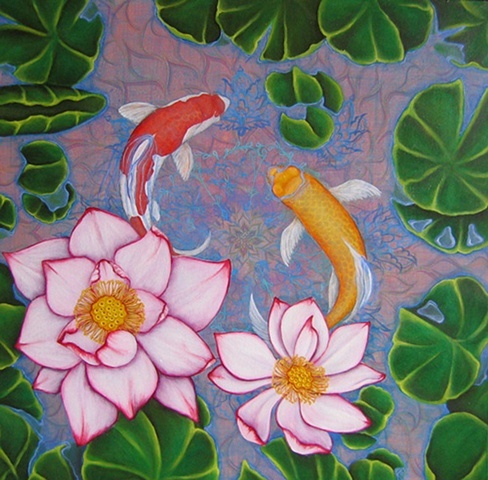 Water Lilies represent the cleansing of the unconscious, the awakening from the muck of everyday existence and blooming pure into a new awareness. They are the symbols for death and rebirth and the ability of our minds to maintain a clarity and original pureness even when submerged in the muck. The koi were added finally and they now swim happily in this calming pool for all eternity. Prints and cards are available for this image. Please contact me with any questions.